Most tektites, with the exception of Moldavite, are black, but these beautiful specimens have a gorgeous straw yellow to pale apple green colour. They also often contain small dark speckles (as this particular piece does), which are remnants of meteor dust. Due to the many millions of years spent being gently polished by the shifting desert sands, they have a very soft, matte appearance. 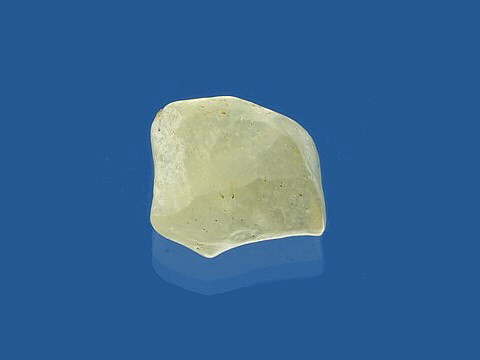 This specimen is a lovely pale yellow in colour and has excellent translucency. Spiritually the planet is undergoing a huge awakening and energetic transformation. We are rediscovering and reconnecting with the Ancients and the knowledge held sacred to them, and as this process gathers pace, we are being given more and more powerful crystals to work with. As our light quotient increases in our energetic body, we have been given access to beautiful Ascension crystals to aid us on this journey, like Phenacite, Azeztulite, Moldavite, Atlantean Record Keepers and Lemurian Seed Crystals to name a few. Libyan Dessert Glass is another of these wonderful, magical stones. This is a stone of Expansion, Compassion, Universal Love and Enlightenment; carrying with it the energy of the cosmos. The carved piece found in Tutankhamen’s breast plate/necklace was designed to be worn directly over the heart, and it is believed that by placing a piece over this area you will be able to activate the higher heart chakra, channelling cosmic energy directly to it. This energy will play a major part in our spiritual transformation and consciousness shift in the coming years, and while much is still to be discovered about this most unusual stone, and we are delighted to have found a genuine supplier so that we may offer a few pieces for sale.